Angry About Dog Fighting? Take the Pledge and Help Spread the Word! Dog fighting does exist in Ontario! Working together we can stop this heinous act and end this cruelty towards animals. Visit EndDogFighting.ca to learn how to spot the signs and join us to help end the fight. Take the pledge and help spread the word by sharing our dog fighting poster using the hashtag #EndDogFighting and tweeting ‘Angry about Dog Fighting? Take the Pledge! Enddogfighting.ca #EndDogFighting’. March is Fix Your Pet Month, and we’re encouraging everyone to spread the word about the importance of spaying/neutering your pet while letting your pet take the spotlight and showcase their Cone of Fame. Show off those cones proudly! Enter the contest today to join the movement. Visit Fixyourpet.ca,enter for your chance to win some great prizes, and help spread the word about the importance of spaying/neutering your pet. It’s the kindest thing you can do! Dave Salmoni is back! This time, he’s going to help show methods of leash training your dog, with the help of Ontario SPCA Inspector Scott Sylvia and Hannah the dog! Watch the video for great insights on how to leash train your dog using positive reinforcement to maintain control. The Whitefish Bay community is committed to reducing pet overpopulation. 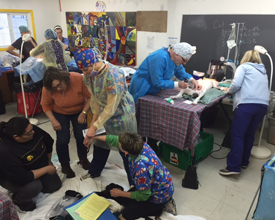 They recently invited the Ontario SPCA, Beat the Heat Kenora, the Grey Bruce Aboriginal Qimmiq Team, the Thunder Bay & District Humane Society and local volunteers, on to the First Nation community to provide spay/neuter services. The Ontario SPCA is pleased to report that 79 surgeries were performed! In addition, the team was able to provide microchipping and vaccines to some of the local pets. A huge thank you to everyone who “baked” a difference and supported National Cupcake Day™ in support of SPCAs and Humane Societies across Canada! There’s nothing sweeter than seeing people rally together to support abused, neglected and abandoned animals. 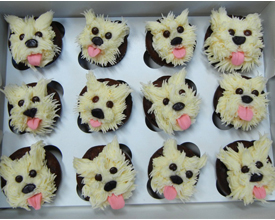 Cupcakes photo by contest winner Ronna M.
Hop on to Paws & Give™ this Easter! Easter is just around the corner. The animals wanted us to remind you that a Rocky & Friends plush toy makes a soft and cuddly gift for your Easter baskets AND helps animals in our care! You can also visit pawsandgive.ca to find a variety of symbolic gifts, all with a printable certificates or eCards to send to the animal lover in your life! Toys for Shelter Pets, Care for a Dog or Puppy, Sponsor an Animal in Need are just a few of the symbolic gifts available...and so much more. 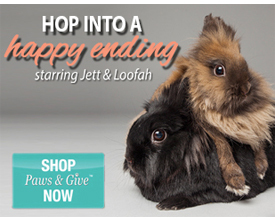 Hop online today and include the animals in your Easter plans!